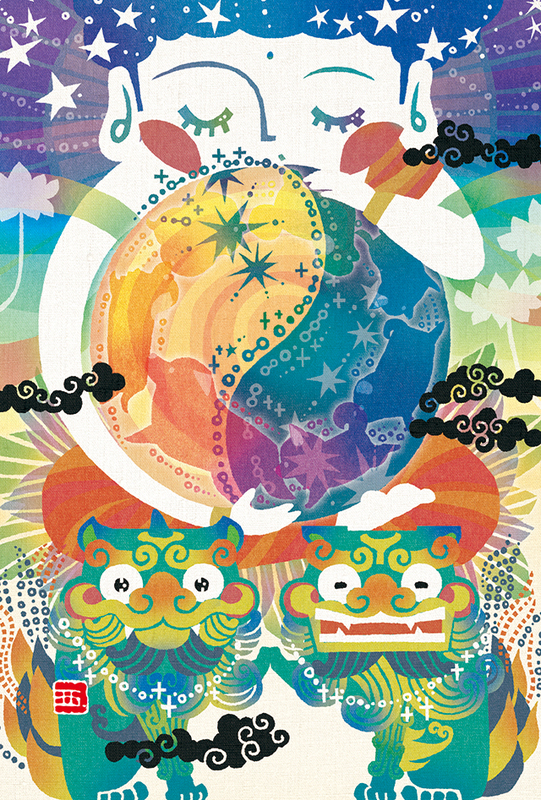 The zodiac was introduced to Japan from ancient China. The zodiac counts “years” to represent Jupiter’s location (position in the sky) during its orbit of one rotation around the sun every 12 years. 12 different animals symbolize each year sequentially, and it is repeated in a 12 year cycle. In Japan, the zodiac is called Eto, and at the beginning of the year we consider the good meanings associated with each animal for the year. 2019 is the year of the boar. 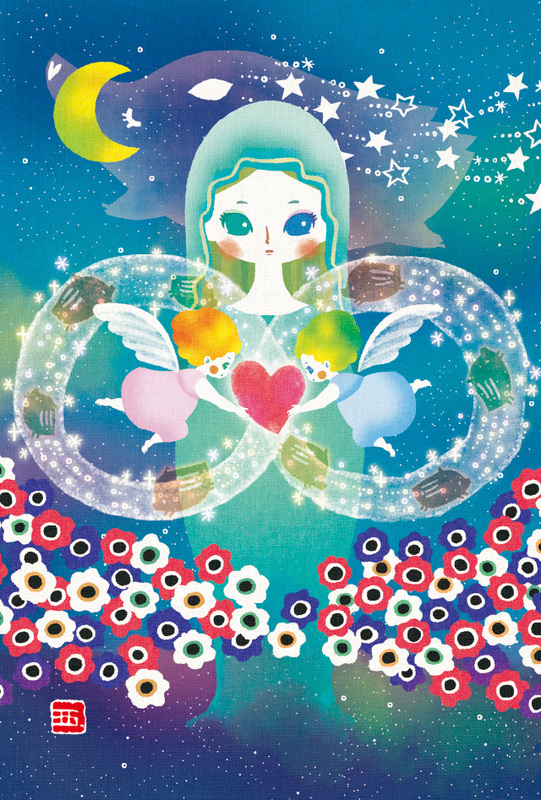 Incidentally, the artist Nishi Yuu was born in the year of the money . * 亥 (boar) and S (the infinity symbol ∞) combine to make the word YES. Light and dark. YES and NO. By taking the contrasting world as “YES,” everything (the universe) is born.The left and right sides of the infinity symbol ∞ represent past and future. Combining them results in “今” (the present). As your heart beats the “今” (present) moves. God took Mary, who gave birth to Jesus (also pronounced IESU in Japanese), as a model, and she is represented in the universe (sky) with the moon as a boar’s tusk, having the “tsuki (moon/stab) advance” through the sky. The flowers are anemone. This word comes from the Greek word for “wind,” and these flowers symbolize “I love you,” “truth,” and “faith.” Right now (今 present or 亥ま boar) you are feeling good 亥い (boar)! Keep that feeling (意 feeling or 亥 boar) going. * In Japanese “亥” is pronounced I. “YES” is pronounced IESU. The I from 亥 combines with the phonetic spelling of ESU from S to make IESU. The dog’s cry of “*WAN!” is the numeral ONE. The meaning of “All is one” is contained in ONENESS (WAN-ness). You are me, and I am you. On the chest of Amenominakanushi, who is said to be the god of the originating heart of the universe, a single orb shows both light and shadow (yin and yang). By accepting truth, the light and the shadow become one, and it becomes an orb of love. The origin of all things is the love itself that is born from the universe. You are a lovable and perfect entity exactly as you are. * In Japanese dogs say, “WAN!” when they woof. That WAN and ONE have the same pronunciation. A life that goes as planned. * 通り (DORI, as planned) and 鳥(TORI, bird) are combined. The peacock is said to be the realization of the phoenix on Earth, and this bird is said to bring in richness, love, beauty, and prosperity while clearing away misfortune. 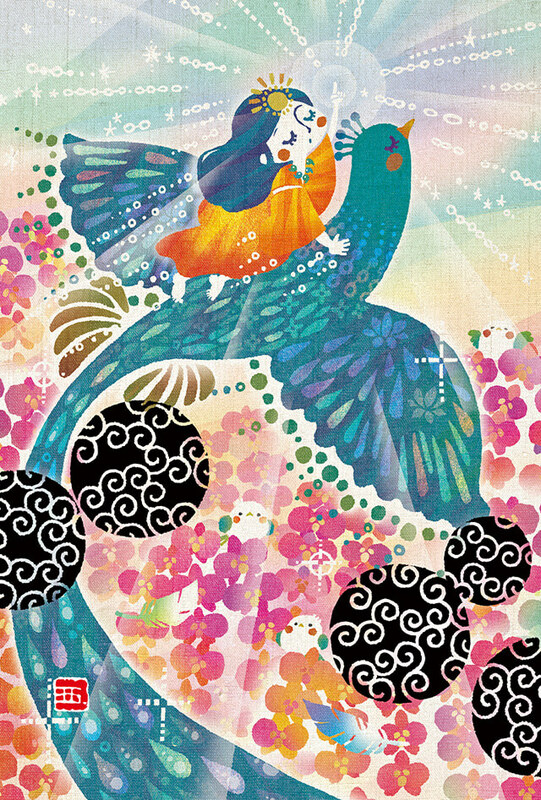 The flowers in glorious full bloom are phalaenopsis aphrodite, which are said to “bring happiness.” Riding atop the peacock’s back is Amaterasu Oomikami (the Sun Goddess). The sun is always casting light, and it is always shining on all of us. Your smile casts light on you, shines on everything, and will keep on shining into the future. * In Japanese “鳥” (bird) is pronounced TORI. In the phrase SUBETEHA OMOI DORI (all goes as planned), the DORI and TORI overlap. * In the Japanese on-reading, “猿” (monkey) is pronounced EN. “縁” (fate) is also pronounced as EN. 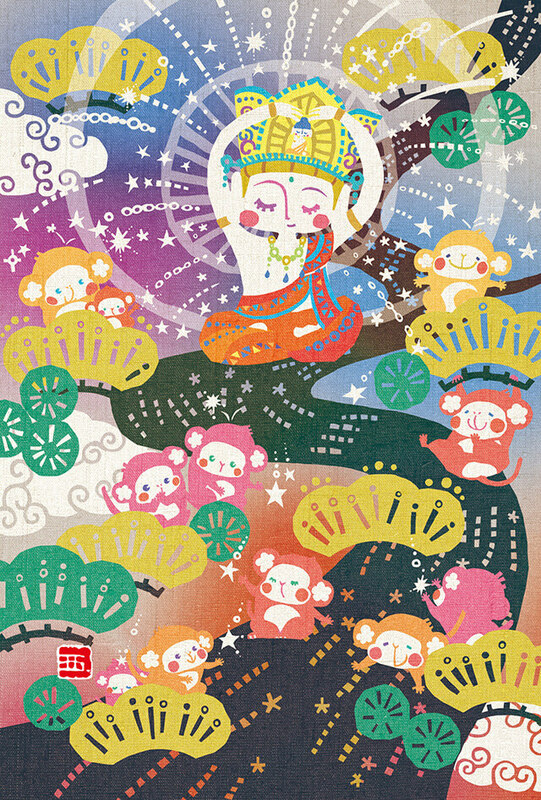 ** In the zodiac, monkey is written using the “申” character. * A sheep (未) is coming (来). This represents the word, “future” (未来). 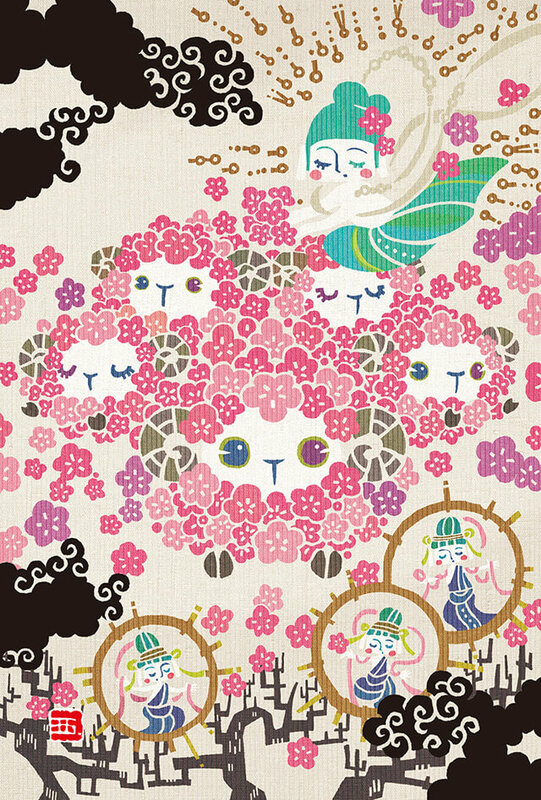 The sheep’s body made of blooming plum blossoms. The person carrying the flowers is ** Maitreya Bodhisattva. Maitreya is the one who controls the “ideal future.” I hope for an ideal future to come like flowers in full bloom. This piece represents the zodiac sheep who makes such a wish. * The Japanese kun-reading of the “未” character is sheep, and the “来” character means to come. “未来” is read as MIRAI in Japanese, and it means future. ** Maitreya Bodhisattva is a bodhisattva that will mercifully save all living things on earth on Buddha’s behalf 5.77 billion years after Buddha’s death. Benzaiten plays the biwa (Chinese lute) while riding a “uma” (horse). Benzaiten is the god of learning and the arts. Everything will “*午 (UMA) 空 (KUU) IKU” (go smoothly). May everything go smoothly. 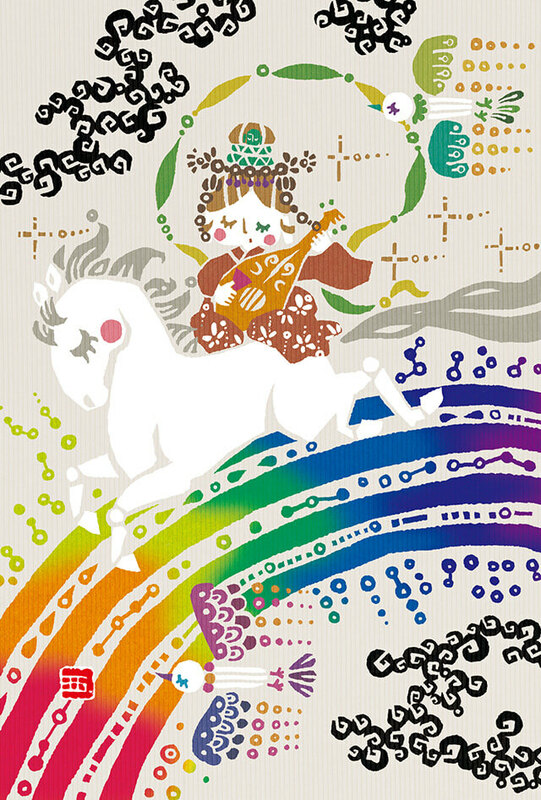 I drew Benzaiten riding a horse and galloping in the sky over a seven colored rainbow after the rain has lifted.